PM Charlot Salwai and PM Manasseh Sogavare after striking a maritime and political alliance to strengthen and consolidate their domestic political power (Photo courtesy of PM Press Secretariat). Solomon Islands MPs has voted 27 to 23 to remove Manasseh Sogavare from office last Monday. MPs cited lost of confidence, corruption and nepotism as the main reasons for the ouster of Sogavare who have been prime minister three times. The move comes as Sogavare was accused of bribing MPs to support him and of the visit to Solomon Islands by long-time benefactor, the President of Taiwan, Tsai Ing-Wen. This development comes as news broke that Mr Sogavare abruptly stopped an anti-corruption bill. A law that would have enabled authorities to enforce anti-corruption measures more effectively. Meanwhile, sources inside the Government of Vanuatu revealed that Prime Minister Charlot Salwai Tabimasmas reacted to the Solomon Islands news with shock, disbelief and anger. 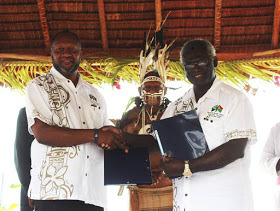 PM Charlot Salwai is a long-time ally and friend of Sogavare. The two often meet together to talk about domestic governance and regional relations matters. Johnny Koanapo the Parliamentary Secretary for the PM of Vanuatu expressed support for Manasseh Sogavare and reiterated PM Charlot Salwai confidence in Sogavare. Sogavare is an honorable person. The trumped-up charges against him will not stand in court. As long as Charlot Salwai is the PM of Vanuatu, we will stand by Manasseh Sogavare until the end. Johnny Koanapo revealed that deep down, Charlot Salwai is afraid that the same fate as Sogavare will be handed down to Salwai. Look, the Government of Charlot Salwai has done good things for Vanuatu, but let's be honest, corruption is still rampant, public services still bad, infrastructure crumbling, jobs non-existent and crimes are all too frequent. Those domestic challenges are made even worse with Charlot Salwai receiving tens of millions of dollars from the Government of China. Some goes into development, but millions go missing to God knows where. "We are more committed to One China Policy". The statement, the second time in just a few days was made in front of the Chinese Ambassador for Vanuatu, Liu Quan. It comes on the heels of the Taiwan's president visit to Solomon Islands and some Pacific countries. Under the watch of Mr Salwai, his government has received millions of dollars to build the longest wharf of the South Pacific in Luganvile, the Prime Minister's Office, the new stadium to host the Pacific Mini Games and the Vanuatu National Convention Centre. Sources reveal that Mr Salwai and Mr Sogavare often spent hours talking about ways to secure foreign money for their political survival and personal welfare. Sogavare, "political misfortune" started when he began to pocket money his government received from Taiwan. "In 2015, Taiwan gave ten million US dollars to the government of Sogavare. Sogavare used this money to bribe and co-opt his political allies and foes. About six million of it was used to bribe fifty MPs. Less than USD700k was allocated for education and development. Sogavare himself pocketed close to one million US dollars." The government of Solomon Islands have been found to commit many human rights abuses. The BBC reported that between 1997 and 2003, 100 people died and 20,000 people displaced on Guadalcanal. The Isatabu Freedom Movement is also seeking to split from the Solomon Islands. Mr Sogavare will serve another month as the care-taker prime minister until the parliament elects a new prime minister in December 2017. Several Opposition MPs are in the short-list to become Solomon Islands next prime minister. Dr Derek Sikua, Independent Group leader and member for Northeast Guadalcanal was reported by SIBC to be a strong contender as Solomon Islands next PM. Mr Sikua served as Solomon Islands prime minister from December 2007 to August 2010.